UPDATE: Bree Newsome was released from jail on Saturday, June 27th and the state is throwing the book at her. She and Jimmy Tyson, the white ally supporting her from the ground, were both charged with "defacing monuments on state capitol grounds" and face up to 3 years in prison and up to a $5,000 fine. This follows a growing trend of prosecutors from Oakland to Baltimore and across the country overcharging people who take non-violent direct action in defense of Black lives. Sign up here to stay updated on ways to help the fight to drop the charges. Early Saturday morning, a multiracial group of Carolinians led by teachers and activists took down the Confederate flag from the South Carolina capitol grounds — within an hour the state had raised the hateful banner once again in time for an 11 A.M. white supremacist rally. Bree Newsome, the Black woman who climbed the pole and cut down the flag, was arrested and taken into custody by Capitol Police. She should be promptly released from jail, any charges should be dropped, and the legislature should immediately vote to permanently remove the flag. "We could not sit by and watch the victims of the Charleston Massacre be laid to rest while the inspiration for their deaths continue to fly above their caskets." The confederate flag was born out of a government defending the enslavement of Black people and resurrected as an emblem for whites violently opposing racial integration. Any government that recognizes the flag is declaring that it cherishes a history of racial terror. Taking down the flag is just one step but a symbolically meaningful one. Make no mistake about it, however, racism isn't just a flag or words it's baked into our economy and inequities in our democracy and criminal justice system. "It's time for a new chapter where we are sincere about dismantling white supremacy and building toward true racial justice and equality." South Carolina officials have sided with white supremacists in choosing to restore the flag before a planned rally. The legislature must immediately vote to permanently remove the Confederate flag from the capitol and all state buildings. 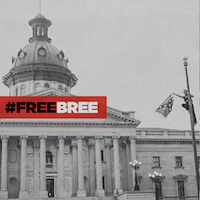 ColorOfChange stands with Bree and the courageous activists who took down South Carolina's confederate flag. You can add a comment using the box provided. UPDATE June 27th, 10:01 AM: Bree Newsome was arrested along with a white ally, Jimmy Tyson. We will update this page with more information as it becomes available. UPDATE June 27th, 3:47 PM: Bail has been posted and Bree Newsome is scheduled to be released in the next few hours. I demand that Bree Newsome is immediately released and any charges against her are dropped.